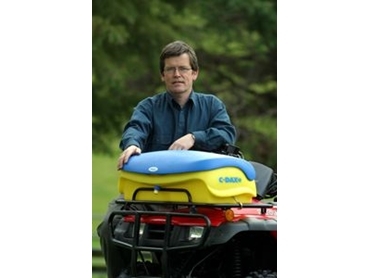 C-DAX's industrial designer Warwick Smith acknowledges that a new ATV toolbox is hardly likely to command front-page news. "I guess that's perhaps the irony of it. Combining simplicity with functional novelty really is the most extraordinary challenge." "The second generation product is however very very different. My brief was to design an aesthetically pleasing product that incorporated an integral fresh water tank. That may sound easy but there are some limitations as to what is practical with conventional rotational moulding technology. Still, we have always pushed the envelope and this project was no exception. It was a great challenge that ultimately made incremental contributions to the process of moving boundaries of what we are able to do in the future." Warwick goes on to say "The G2 Boxmate is incredibly clever for something as simple as an ATV toolbox. Its lines are very 21st Century and the 1-litre freshwater tank will be one of those utility features that is si frequently used that it's taken for granted." Mr Smith says that C-DAX's patent attorneys were most enthusiastic about the novelty in the new box. "On their recommendations we have registered the intellectual property. Our attorneys are of the view that it was real ground breaking stuff."